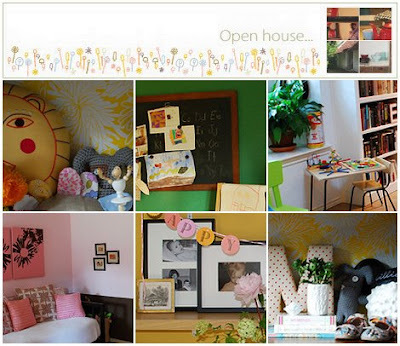 The very cool Irene of Bloesem featured some shots of our playroom/den and the girl's rooms as the Open House feature on bkids. Great pictures! Looks like you have a warm home full of happy things. it's official...I want you to move into my home for about a month and help me with my house...beautiful. You must be so proud. I love little girl rooms, especially yours! WOW! I just got a chance to check out the post on your home and am seriously giddy right now. Everything is absolutely lovely! I really love the orange storage stools in the family room. Where did you get them? Thanks so much! i got my orange storage stools at a sample sale, but you can get them from the Jayson Home and Garden site. Thanks for the link! They are going on my wish list, as I am always on the lookout for attractive storage solutions. I have two daughters as well, and the amount of toys we have accumulated is ridiculous! so beautiful!! your taste is perfect.